When I was growing up, my parents didn’t spend any time teaching me about investing. They talked about saving, minimizing debt, and making wise spending choices, but investing didn’t come up in conversation. I didn’t realize that investing was something I could actually get involved in until I was in college. I’m determined to make sure that my son has some experience with investing before he leaves the house. 1. Buy them stock in a company. This is actually something that works well for children that are young. You can choose a publicly traded company that your child might be interested in, like a department store chain, toymaker, or food company. Then you buy a couple shares of stock in the company. In some cases, you can get a paper certificate (Disney makes some attractive ones) printed out, so that you can frame it. Explain to your child that they now have some ownership in that company. You can occasionally check to see how the company is doing, and encourage your child to read up on the company. My 10-year-old son is always paying attention for news about his favorite companies. 2. Let older children play investing games. There are games out there, geared for tweens and teens, that can teach your children about money – including investing. There are stock-trading games that you can get your children involved with. You can sign up for free, and your kids can get a solid idea of how the stock market works. Games like How The Market Works can help you and your kids practice making trades, as well as learn about how investing works in the stock market. Encourage your child to play these types of educational games. They can help your child learn more about how money works, and improve their understanding about what is happening. Don’t forget to actually open an account and encourage your child to invest. I have a 529 plan for my son, and I occasionally show him the results of my regular contributions. He contributes, too, with some of his long-term savings money. 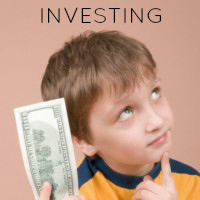 There are other ways to help your child start an investing account. If your kids are earning income, they can have IRAs opened in their names. Get your child started investing in a Roth IRA when they get a first job, and the chances of a successful retirement increase by quite a bit. You will have to be in control of the account until your child reaches the age of majority, but it is still in their name, and contributions can be made. You can also open a custodial account at an online brokerage. When your child reaches the age of majority, they get control of the account, but until then you have to make the actual trades and manage the account. Encourage your child to make regular contributions, and watch the account together. Talk about long-term investing, and talk about the importance of not letting short-term problems with the market lead to panicked trading decisions. Make sure that your child is ready to understand investing to some degree before you begin teaching them. Most children can start grasping the basics of owning a stock while in fourth or fifth grade. Many kids are ready to start understanding more about trading and investing on a better level by the time they are 12 or 13. Don’t be afraid to talk about investing in your home, and let your child see some of the positive results. You’ll have savvier kids who are more likely to succeed financially later on. Have you taught your children about investing? What are you teaching them and at what age? Leave a comment and let us know! This article was originally published December 11, 2012.